The latest newspaper circulation results offer a grim reality check for both Fairfax and News Corporation Australia. Fairfax's metropolitan papers continue to bleed sales, despite the shift to commuter-friendly compact formats. News' biggest-selling papers recorded unprecedented double-digit circulation drops year-on-year. And monopoly status is offering no protection for regional papers, which are rivalling their big-city brethren for circulation declines. It's red everywhere, but Fairfax's print circulation declines have been the deepest, ABC data reveals. 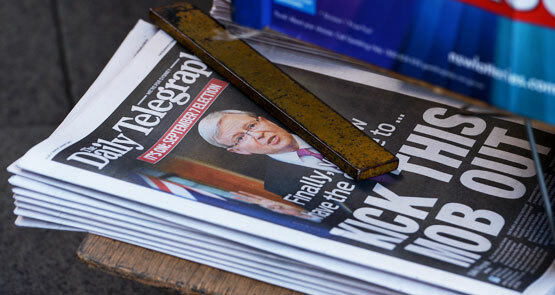 Newspapers continue to bleed, with fresh circulation stats showing double-digit drops in sales of Fairfax and News Corp titles over the last quarter. The one publication that is not dropping by too much? TV Week. The latest Audit Bureau of Circulations results show massive drops in print circulation and reveal, finally, how many readers are paying for the Herald Sun online. Hint: it's not very many. The latest 2011 circulation figures indicate that it was a mixed-to-good December quarter for some titles, an average half-year for others and another miserable 12 months for the majority of newspapers and magazines. Despite the usual attempts to spin the numbers, the quarterly newspaper circulation figures for March were not good.